In my younger days, I enjoyed an Amaretto Sour or 2 or 3…. I have been a fan of the amaretto flavor for quite some time. Lindt chocolate used to make an amaretto truffle that came in a shiny purple wrapper but I haven’t seen them in years. That makes me sad. What makes me happy is being able to bake sweets that use Amaretto as a flavoring agent. So, of course when I saw the recipe for these cupcakes in a recent Cooking Light magazine I just had to make them. They also gave me an opportunity to use some of the apples we picked from the orchard. The cupcakes were relatively easy to make. I would love it if they had a touch more amaretto flavor though. 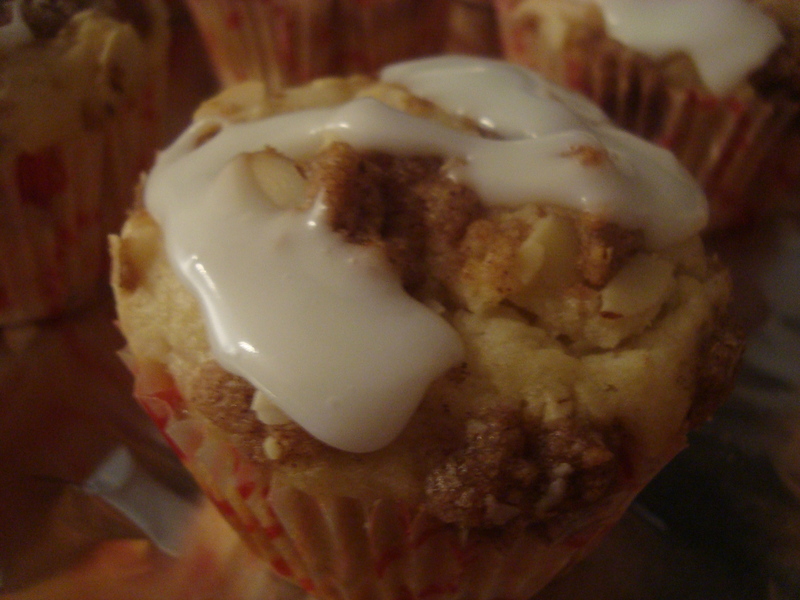 Next time I am going to try adding a splash more amaretto to the cupcake batter and a little bit to the glaze as well. I’ve made tiramisu several times in the past so was interested to see exactly how Dorie Greenspan’s twist on this classic dessert would turn out. Dorie’s tiramisu cake is a layer cake made with yellow cake, a creamy marscapone frosting, a liquor syrup, and chocolate. I was extremely tempted to make a mini version of this cake or turn it into a trifle, since I’ve stated before, frosting cakes is not my strong suit. But, I was feeling slightly less than creative and ended up pretty much following the recipe word for word. I skipped sprinkling the cocoa powder on top but did put some Trader Joes chocolate covered espresso beans on top. For being a tiramisu cake I found this cake to be a little dry. I think one of the best parts of traditional tiramisu is the way the ladyfingers end up nice and moist and the flavors meld. I didn’t quite have that result with this cake. Perhaps if I make this cake again I will double the syrup to allow the cake to have a more boozy soak. The recipe for this cake can be found in Bakingby Dorie Greenspan or on Megan’s blog My Baking Adventures. Check out how the rest of the bakers did with this cake on the Tuesdays with Dorie blogroll. Plain yogurt is one of those staples that we always have in our fridge. We use it a lot… in raitas, sauces, baking… you name it. I was thrilled to discover that I already had all the ingredients for Dorie Greenspan’s French Yogurt Cake already on hand in my kitchen…no need to run out to the grocery store. I changed Dorie’s recipe slightly to use orange zest instead of lemon zest in the cake batter and to glaze the top with orange marmalade instead of lemon marmalade. 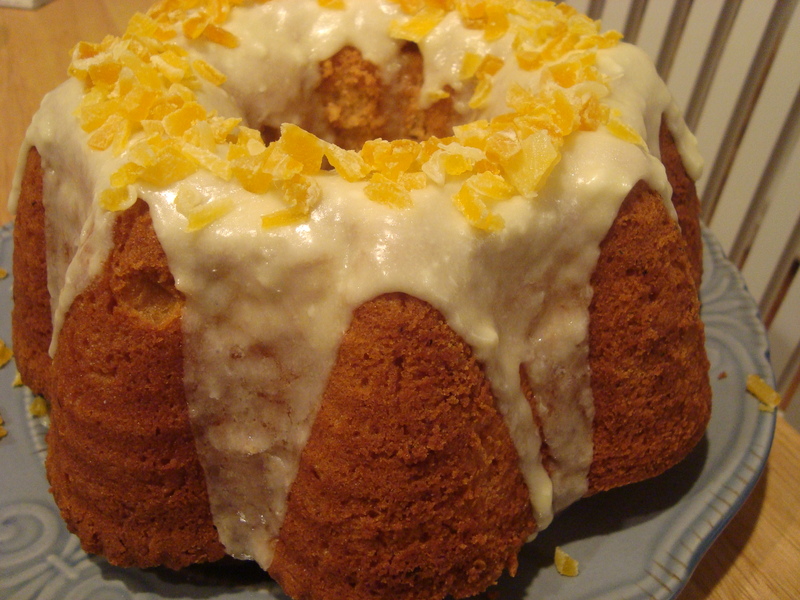 The yogurt cake was almost everything my husband looks for in a cake: moist and citrusy. He uttered a “Woah” as he took his first bite. 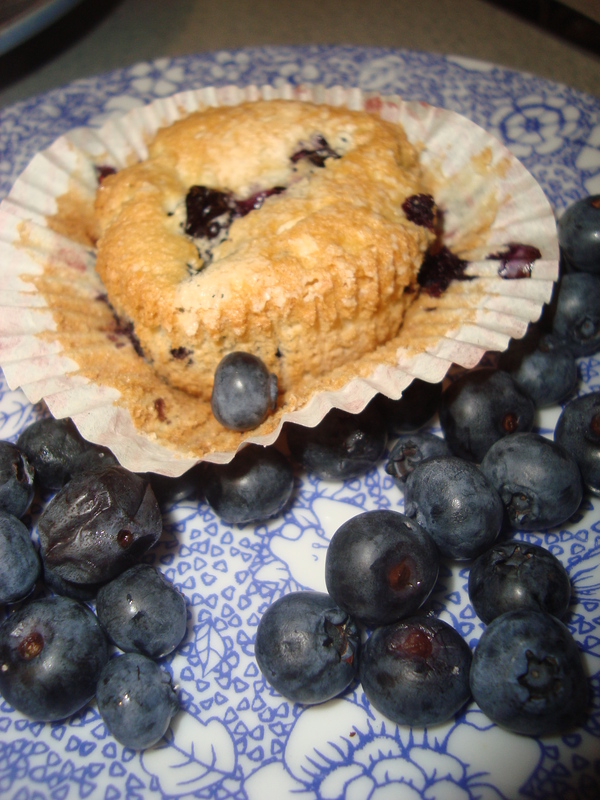 For the recipe go here to Liliana’s blog My Cookbook Addiction. Thanks Liliana for selecting the recipe! Check out what the other TWD bakers are making on the TWD blogroll. So, this week’s TWD recipe was Blueberry Crumb Cake, but I just had to Mango-it-up. 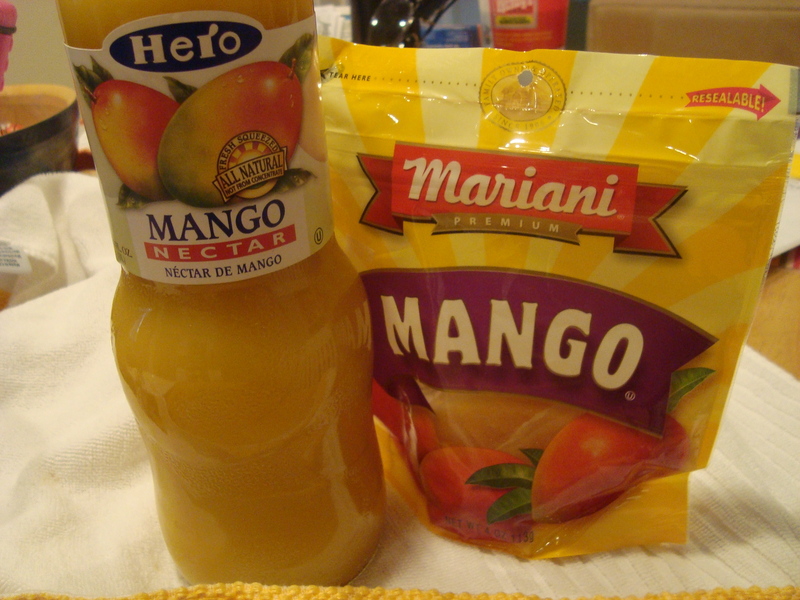 I substituted diced fresh mango for the blueberries and orange zest for the lemon zest. I also veered off the beaten path slightly from Dorie’s instructions and mixed the crumb topping by hand rather than drag the food processor out of its hiding place. Plus, I baked this cake in the wee hours of the morning and didn’t want to wake up my honey with the whirring of kitchen machinery. 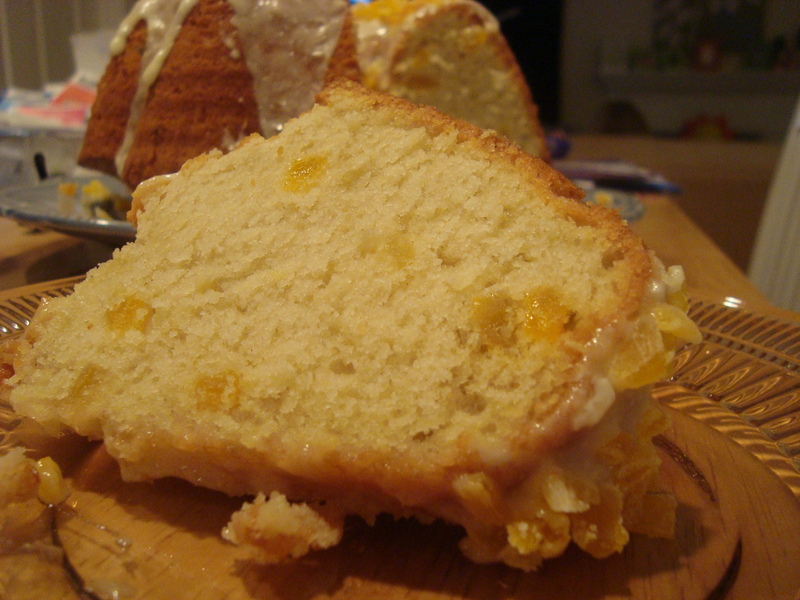 The resultant cake was moist and studded with juicy bits of mango. The cinnamon, nutmeg, and orange zest in the batter added a nice flavor the complimented the mango well. Though my husband did use this as another opportunity to preach to me about how the mangoes in American supermarkets are nowhere near as good as the ones that he can get back home. Sigh, then take me THERE and buy me a mango! Sihan of Befuddlement chose Dorie’s Blueberry Crumb Cake for this week’s Tuesdays with Dorie selection. She has the recipe posted on her blog so be sure to stop by and check it out. I originally found this recipe several years ago on the Bailey’s Irish Cream web page. I don’t want to sound like a total booze-hound, but I love the flavor of Bailey’s Irish Cream, so any dessert that contains it immediately catches my eye. This is one of these not-quite-from scratch recipes that starts off with a box of cake mix. If you won’t tell, I won’t tell. I took this cake & the Chocolate Irish Whiskey cake to a family St. Patrick’s gathering at my mother’s house this past weekend. After a brief game of family trivia (How come all of the questions were about the older generation??? ), and stuffing ourselves with corned beef and cabbage, we all dug into the never-ending supply of desserts. The Irish Cream cake was a super hit– moist with a nice touch of added crunch on top from the pecans. The Irish Cream glaze was gooey and caramel-like. The alcohol in the glaze doesn’t completely cook off, so don’t eat too much of this cake or you might get a bit tipsy. I hope that everyone’s cake buzz wore off before they had to drive home! Preheat oven to 325 degrees F (165 degrees C). Grease and flour a 10 inch Bundt pan. Sprinkle chopped nuts evenly over bottom of pan. In a large bowl, combine cake mix and pudding mix. Mix in eggs, 1/4 cup water, 1/2 cup oil and 3/4 cup Irish cream liqueur. Beat for 5 minutes at high speed. Pour batter over nuts in pan. Bake in the preheated oven for 60 minutes, or until a toothpick inserted into the cake comes out clean. Cool for 10 minutes in the pan, then invert onto the serving dish. Prick top and sides of cake. Spoon glaze over top and brush onto sides of cake. Allow to absorb glaze repeat until all glaze is used up. To make the glaze: In a saucepan, combine butter, 1/4 cup water and 1 cup sugar. Bring to a boil and continue boiling for 5 minutes, stirring constantly. Remove from heat and stir in 1/4 cup Irish cream.